KABUL, Afghanistan — At least 18 people, mostly civilians, were killed Saturday when a suicide car bomber targeted a convoy of provincial security forces in eastern Afghanistan, an Interior Ministry official said. Najib Danish, the ministry's deputy spokesman, said the target of the bomber was a group of guards providing security for U.S. forces in Khost province, but most of the victims in the attack were civilians. Zabihullah Mujahid, a spokesman for Taliban, claimed responsibility for the attack in a media statement. Taliban insurgents have increased their attacks against Afghan security forces since announcing their spring offensive last month. The security forces were attacked near the province's main bus station, said Danish. 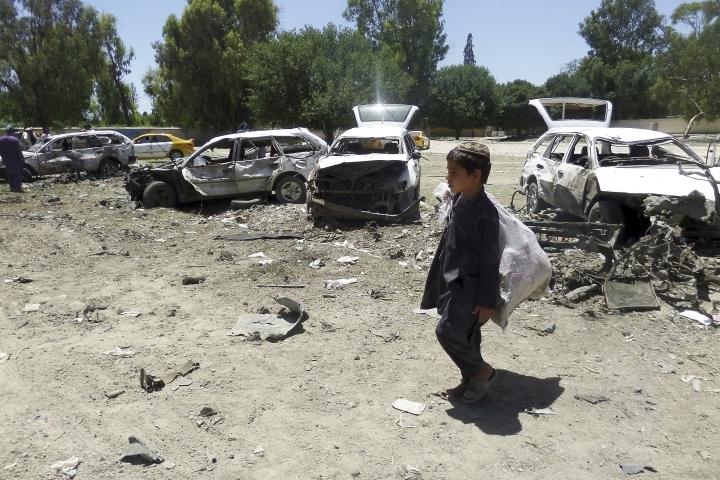 "Six other civilians including two small children were wounded in the attack," he said. The attack, which took place on a road between the bus station and the provincial football stadium, damaged or destroyed about a dozen shops and several vehicles. The attack came on the first day of Ramadan, the Muslim holy month. Mubariz Zadran, spokesman for the provincial governor, said the casualty number could rise because some of the wounded were in critical condition. Meanwhile, at least six civilians and 15 fighters from an Islamic State group affiliate were killed in eastern Nangarhar province, said Attullah Khogyani, spokesman for the provincial governor. Separately, two police officers were shot and killed in Kandarhar by unknown gunmen late Friday, said Samim Khpolwak, spokesman for the provincial governor. He said another policeman was wounded in the shooting and an investigation was underway.